Place the coconut milk, water, lemongrass, lime leaves, salt and chicken in a medium frying pan over medium heat and bring to a simmer. Reduce heat to low and cook for 20 minutes or until the chicken is cooked through. Remove the chicken, cover and refrigerate until cool. Shred the chicken using 2 forks. To make the dipping sauce, place the fish sauce, sugar, lime juice and chilli in a bowl and mix to combine. To assemble the rolls, dip 1 rice paper round in a bowl of cold water for 10 seconds to soften slightly. 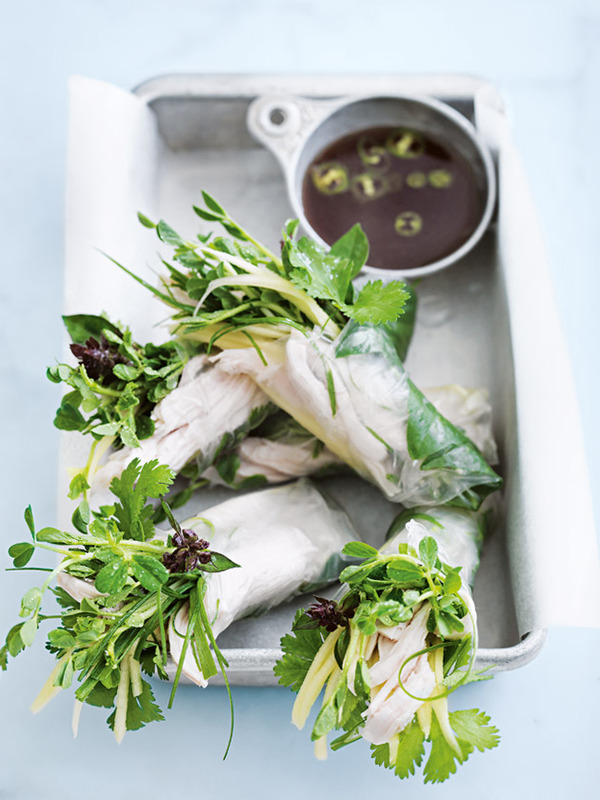 Place on a clean, damp tea towel and place a little of the basil, coriander, chicken, mango, snow pea shoots and onion down the centre of the sheet.